Were I to be asked my favourite website on the whole of the Internet, there would be no hesitation in answering that it was timeanddate.com. It offers information about the enduring and inescapable realities of life: sunrise and sunset, equinoxes and solstices, weather and seasons, phases of the moon and the distance and trajectory of the sun, time zones and calendars, for any place in the world in a forty year span. It is the stuff that would have endlessly fascinated scientists of former times, those who began the processes of measuring and predicting and making reality something numerical. 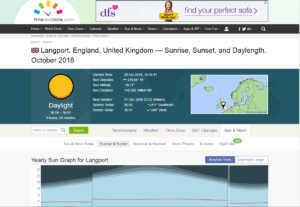 Today in Langport the sunrise was at 0656 and the sunset was at 1651. There is encouragement in the fact that the sunset will only come a further forty-five minutes earlier, setting at 1606 on Friday, 21st December when the winter solstice will be at 2222. There is discouragement in the fact that the sunrise on 21st December will not be until 0812, a full one hour and sixteen minutes later than it was this morning. Although the solstice is only seven weeks from Friday, there is still time for the daylight to retreat by another two hours. Once, such information would have been important in everyday life. Each year my grandmother would buy a copy of Old Moore’s Almanack, along with its usual content of charlatanism and quackery, it would offer sunrise and sunset times for the year as well as phases of the moon. In a deeply rural community, the availability of light, whether solar or lunar, was important to the tasks of the farming year. A clear full moon on a summer’s night would offer enough light to continue the work of the day. Undeniable realities were expressed in precise times and dates. Among the silliness of the astrology and predictions for the year, there were things that were measurable and universally true. It seems unlikely now that anyone would buy a book to know at what time the sun would rise or set on a particular day of the year. Such information is no longer critical, and if it is sought, then it can be found in an instant by checking online. No longer do most calendars include details of whether the moon is new, at first or last quarters, or full. The decline in the need for such information has been part of a disengagement from the physical universe. It is hard to imagine that those whose lives depended on the light would have comprehended the world of social media and celebrity television. Sites like timeanddate.com are a reconnection with the realities important to our forebears.